The first stamps were issued by the Imperial Customs Post and used for departmental and international diplomatic mail. 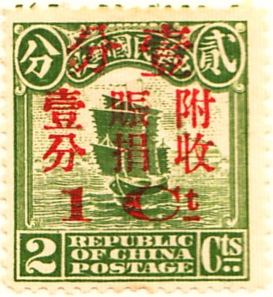 The stamps imitated those of Shanghai (the first treaty port, 1878): a set of three Large Dragons issued in 1878 and three smaller dragons in 1885. 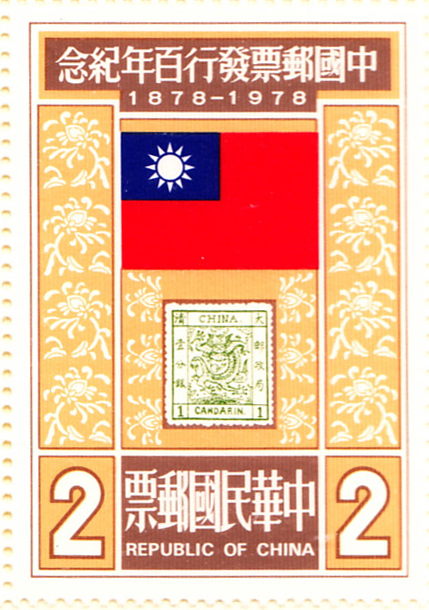 All are expensive and so are represented by a 1978 Taiwanese stamp that commemorates the first issues in a rather small way and a 1988 miniature sheet on the reverse of this page which makes a rather better job of it. 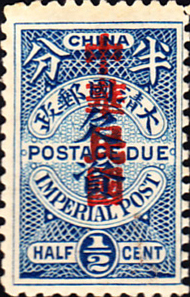 In 1897, the Chinese Imperial Post was introduced which, by decree, put the treaty ports' municipal posts out of business. There were eight designs in the first 1897 issue, all expensive and all reprints of the first commemorative. In 1911, Dr. Sun Yat-sen led a 'successful revolution ... against the faltering Manchu Dynasty which resulted in his becoming president of a new republic of China in 1912' Wood . The first stamps of the republic are overprints of Empire stamps: Gibbons and Scott differ in the catalogue order, and so the choice is Scott's 75c Sc146 rather than Gibbons' £80 SG172. 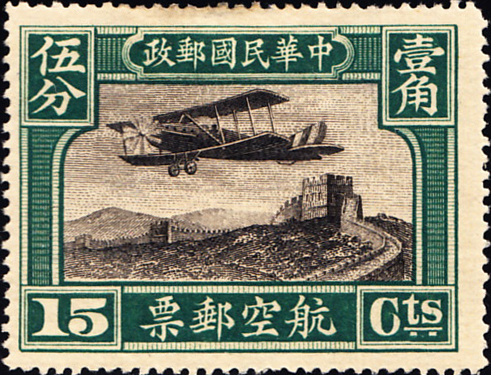 The first real stamp and first commemoratives were issued in December 1912 in two designs, one portraying Dr. Sun Yat-sen and commemorating the revolution, the other portraying President Yuan Shin-kai, commemorating the republic. The first airmail of 1921 is rather expensive at £28/30, but was redrawn (1929, SG384/Sc-C6) in 1929 to give the plane a different tail fin design (the nationalist sun emblem rather than the bars of the republic flag) and the later version sells for £5/65p. As with the definitives, the early post dues were overprints and the first of one of the inexpensive groups is shown.